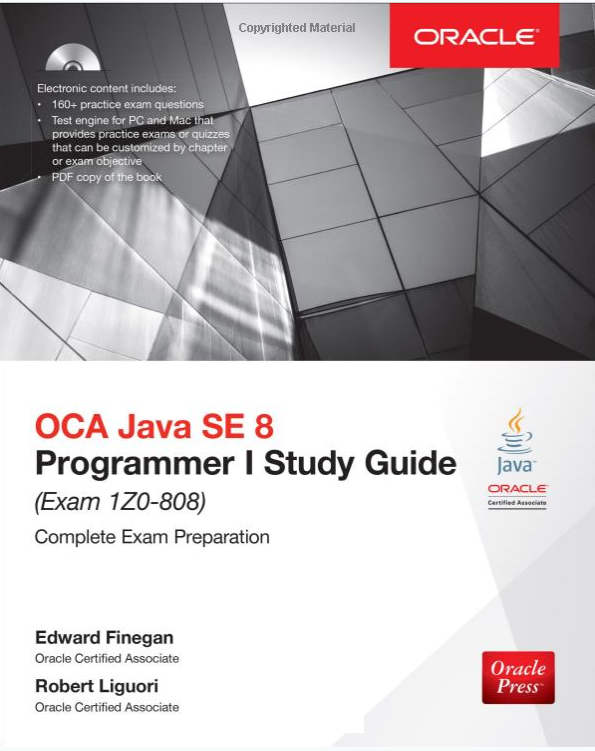 In order to become a Java 8 Certified developer, you need to pass two exams, the OCAJP 8 exam with code 1Z0-808 and the OCPJP8 exam with code 1Z0-809. You will not be a Java SE 8 certified programmer if you just pass the OCAJP8 exam. In order to prepare for both these exams, you need to choose a good study guide and a good mock exam simulator, apart from writing programs on daily basis. Since there are a lot of demand for Java 8 certified professionals across the world, it seems to be a good opportunity to change your career path by learning Java 8, if you are doing some boring IT work and wants to become an application developer. The Java certifications will provide you both knowledge and competitive edge over other candidates who are applying for same Java developer job. 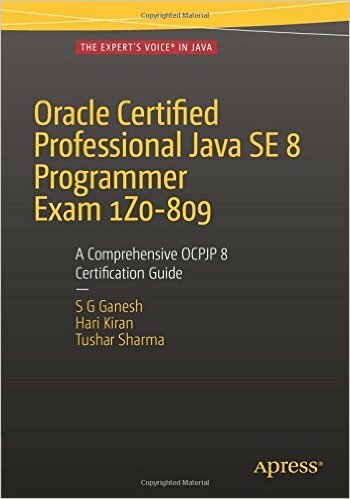 Since it's almost 3 years sine the launch of Java 8, 18th March 2014, both OCAJP8 and OCPJP8 are now established exam. You will find a lot of books, materials and mock questions on the internet for preparing these two exams. But, if you are not careful, you will lose a lot of time chasing for resources which are not very helpful. In order to create a plan and then work on that plan to get Java 8 Certification, the first step is to choose a good book or study guide. In this article, I am going to share some of the best OCAJP8 and OCPJP8 books you can choose from. One of the important steps to succeed in Java 8 certifications like 1Z0-808 and 1Z0-809 is to choose one study guide for OCAJP8 and one for OCPJP8. The study guides not only covers exam topic in full but also provides exam tips related to every topic. If you are happy with 90% score than one study guide is more than sufficient, provided you also have a good exam simulator like Whizlabs, Enthuware, or David Mayer's online CertificateQuestions. The combination of a Study guide and mock exam is the best to crack any Java certification in limited time. This is an excellent study guide for the OCAJP8 exam. Mala has done a tremendous job on providing quality content specially tailored for certification need. This book not only covers all exam topics but also highlights key concepts which are important from exam perspective and which are the base for tricky questions. The book also contains a full-length mock exam, which you can use with any professional exam simulators e.g. David Mayer's 1Z0-808 dumps. 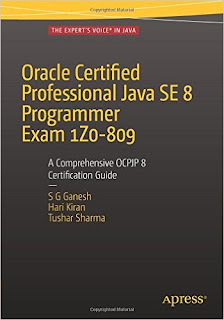 This is another good book to prepare for OCA or Oracle Certified Associate Java SE 8 Programmer I certification i.e. exam code 1Z0-808. The book is a complete study guide for Java 8 OCA certification and covers every single exam topic. The book starts with an assessment test, which is really nice way to gauge where do you stand in terms of your knowledge of Java 8 and OCA exam objective. This will give you a good idea bout how long it will take for you to prepare for OCAJP 8 exam or 1Z0-808. Similar to Whizlabs 1Z0-808 exam simulator, it also explains why correct answers are correct and why incorrect answers are wrong, which will help you to build your concepts and avoid misconceptions. 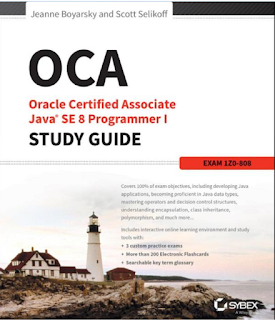 This is the 3rd book to prepare for OCA Java SE 8 Programmer I Study guide or Exam 1Z0-808 and the best part of this book is that it comes from Oracle and Java, which means you can be rest-assured that it covers every single detail of 1Z0-808 Exam objectives. The book also comes with a CD of mock exams which you can use for further preparation but mock exams are not really up-to-the-mark and very easy as compared to the real exam. It's better to rely on the professional Java 8 simulators like Whizlabs or Enthuware. You can find a goo list of Java 8 simulators here. 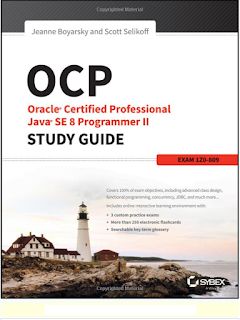 This is the latest and greatest study guide for Oracle Certified Professional Java SE 8 Programmer Exam or 1Z0-809. You will find a lot of small, practical code examples which is really important to truly understand Java 8 concepts. The book not only covers each and every exam topic of 1Z0-809 but also present new features of Java 8 in easy to understand manner, with proper exam tips. The book also contains a lot of practice questions on each chapter, including full-length mock exams, which you can take along with David Mayer's free Z0-809 dumps to test your preparation before going for exams. This is the 2nd part of by Jeanne Boyarsky and Scott Selikoff guide for Java 8 Certification. 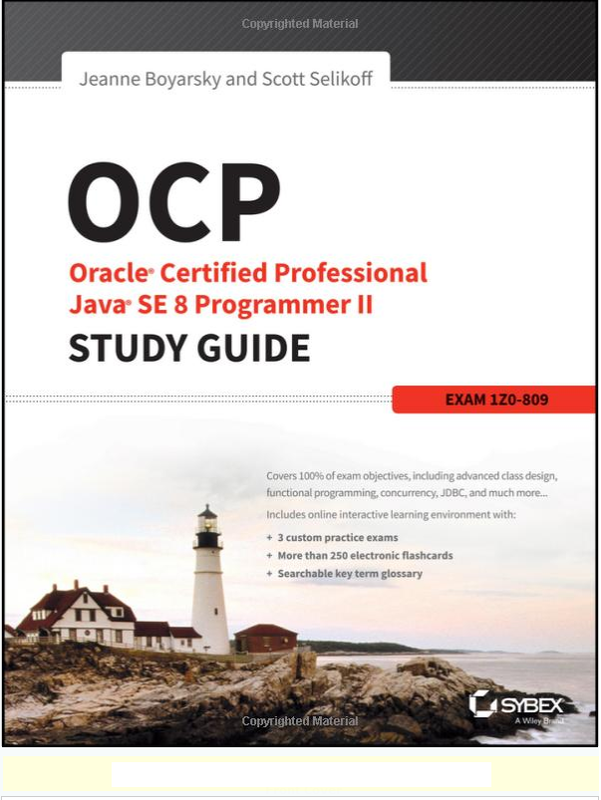 The first guide covers OCA exam and this guide covers OCP exam or 1Z0-809 exam, but I found this book is also a great resource for programmer who are looking to upgrade their certifications i.e. programmers who currently hold Java 6 or prior version of certification and preparing for 1Z0-813 exam and Java SE 7 certified developer who are preparing for 1Z0-810 exam. Here are some of the useful resources for preparing OCAJP8 (1Z0-808) and OCAPJP8 (1Z0-809) examination. Some resources are free and you have to buy some resources, but given the actual exam cost is 245 USD or 10,100 INR, it worth spending some more money to prepare well. It's better than taking the retake of the exam. That's all about some of the best books to prepare for OCAJP8 and OCPJP8 certification. 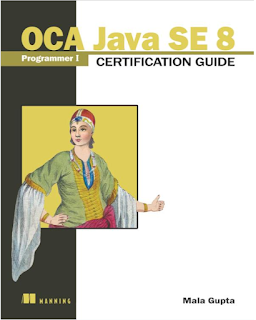 As I said, it's not enough to just pass OCAJP8 or 1Z0-808 exam if you aspire to become a Java SE 8 certified programmer. You won't get the title or certification until you pass the OCPJP8 i.e. 1Z0-809 exam. That's why I have shared books for both OCAJP8 and OCPJP8 certification as it doesn't make any sense to prepare for just OCAJP8 or OCPJP8. Though, there are some other ways to become Java SE 8 Certified Programmer e.g. if you already hold a Java SE 7 certification then you can give the 1Z0-810 exam to become a certified Java Se 8 programmer. Alternatively, if you are an SCJP 6, SCPJP6 or SCPJ 1.4 programmer or hold any Java certifications for lower versions, you can give Java SE 8 Upgrade exam to become a certified Java 8 developer. The exam code for that exam is 1Z0-813. I strongly suggest even for certified Java developer to upgrade their certification for better Job prospects, recognition, and getting the competitive edge over other candidates.